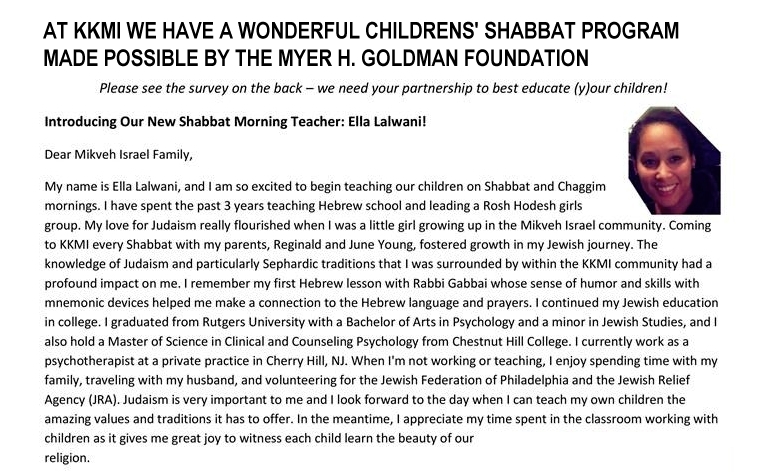 Morah Ella Lalwani leads our children's Shabbat Group every Shabbat morning. We hope that your children will join us! - Group begins at 10 am with a Hebrew Warm-Up letter and word of the day. - At around 10:30 am, after the children have joined us for taking out the Torah, Ella teaches a lesson about the Torah Parsha. - The children lead the congregation in Yimloch and, after witnessing the return of the Torah, return to the children's room for KIDdush and Hafsaka (recess - with games like Jewish Spot-it). - The weekly children's programming ends in time for the children to join in our community Kiddush.